You bake tasty rolls, repair our beloved cars, rescue the hairstyle just before the date and you build the houses of our dreams. In many walks of life, we have to rely on the skills and know-how of skilled craftsmen and women. Crafts and trade are a vital factor for the German economy. That's not the only reason that it's important that you – our craftsmen – stay fit and healthy in the long term! A construction worker bends down hundreds or thousands of times a day. You know what we're talking about! Think about your back and bend at the knees when you lift heavy loads. Hold the object as close to your body as possible and only pass it on with your back straight. It's better to carry a lighter load twice than a heavy one once. Push or pull it instead of lifting it. Use a wheelbarrow, crane and suction lifter whenever possible. Hazardous substances are those that pose a potential chemical risk – because they can, for example, be easily flammable, corrosive or poisonous. In workshops, garages and factories, these may include asbestos or welding electrodes that can be harmful to health as smoke or dust. When employers and employees work together to ensure safety at work they work responsibly and stay healthy. Find out all you can about the options that are available for your work and, where necessary, wear protective clothing such as safety goggles, gloves and a face mask. The walls have to be painted quickly and the cake's waiting for the perfect decoration – it's your job to work quickly, but perfectly every day. Craftsmen are also exposed to situations at work that trigger stress. Tight deadlines, too much work, different building sites, noise, dust, heat or cold. Start looking for solutions to your stress now and organise your time. A weekly or monthly plan gives you a clear overview. Add a little time for unforeseen events. Take regular breaks to relax and recharge your batteries with the energy you need. In a joiner's workshop, for example, it doesn't just smell sweetly of wood, the work at the machines is also loud. Sometimes ear protectors have to be worn. Look after your health and avoid loud noise. Observe the company rules and find out exactly whether ear plugs are enough or whether earmuffs or a sound proof helmet are mandatory. Try to spend as little time as possible in a noisy areato spare your hearing and body. Pay attention to the veins in your legs, above all if you stand a lot! 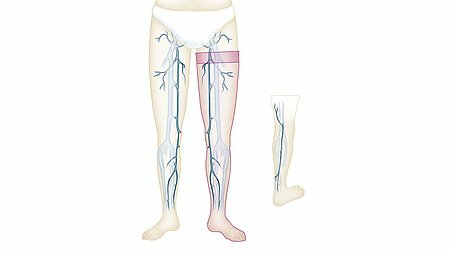 Because this is when the vessel walls stretch and varicose veins, phlebitis or thromboses can occur. Compression garments such as mediven active, which are matched to the needs of active men, prevent venous diseases. The socks ensure more well-being when work involves mainly standing. These are available from surgical appliance retailers. If you have backache, special back supports can help stabilise the back and reduce muscular tension. Various knee protector models have proved effective in reducing stresses when kneeling. 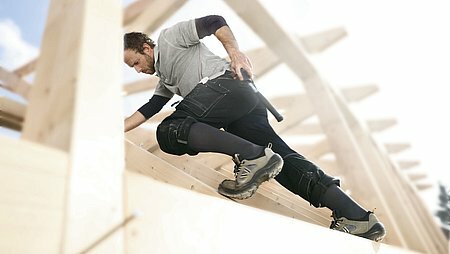 Besides suitable socks and supports, trades associations also offer solutions: the Professional Association for the Construction Industry (BG Bau) has collected the best ideas in its "database of ergonomic solutions": www.ergonomie-bau.de.